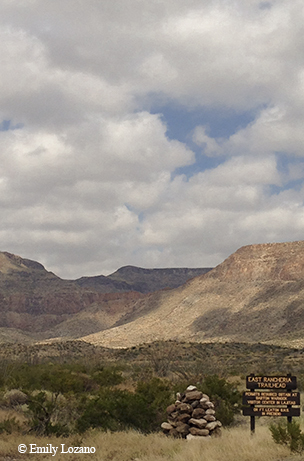 Nature provides thrilling vistas and meditative solitude for Big Bend Ranch backpackers. In the dying light, we race to pitch our tents as the lightning storm roars down on us. Our group of 11 backpackers had started later than planned on day one of this three-day, 19-mile hike on the Rancherias Loop at Big Bend Ranch State Park. Our goal had been to reach Casa Reza and its nearby spring, where we could filter precious water and camp the first night. But as we struggle up the rocky way it becomes clear to me that we will have to make camp soon. Chasing up behind us is an ominous wall of gray-black clouds, pierced by the flicker of lightning. A big storm is coming. We cross a final high saddle between two mountains, about to descend into Panther Canyon. Flat, open areas to accommodate tents are rare on this steep trail, so I take note when we come to flat gravel and open space amid the thorny ocotillo and spear-like tasajillo and cholla cactus. This will have to do. Soon it will be too dark to follow the trail from one stacked rock cairn to the next. And a half-mile back, our lead hiker almost stepped on a rattlesnake coiled right on the trail. “We need to get our tents up now,” I tell those with me. Our group is composed of Texas State Park Ambassadors program alumni, 20-somethings who put in four months of volunteer service at a state park, doing outreach-focused work like spreading the word to college campuses and peer groups, among other things. Some have backpacked; many have not. Ambassador program leader Tyler Priest is close behind us on the trail with some slower folk, and soon they scramble up and we all race to pitch the tents. The wind starts gusting more than 30 miles per hour; our tents become sails. I manage to stake down all four corners of mine, putting big rocks atop the nylon corner ties to anchor them. The light is almost gone, so we turn on headlamps. Despite the gale, I wrestle the flapping rain fly on, but upside-down. No time to fix it. I help one of the alums pitch her tent, and then we’re out of time. We dive into our tents, and the storm roars over us. I can hear rain pelting the tent fly, the thunder and the whoosh of wind, punctuated by the crackle of blinding lightning flashes. The wind increases its assault, and the tents begin to buckle, flapping like crazy and flopping over as if a giant hand is pushing them to the ground. I begin to worry that the wind will peel our tents right off the mountain. Then, at the height of the tempest, I hear unexpected mirth in a nearby tent. Jordan, Emily and Lauren emit a chorus of shrieks that dissolve into laughter every time the wind flattens their tent. “It’s going to give us black eyes!” I hear one of them yell, and the others howl and laugh all the harder. Maybe they’re just whistling in the dark, a nervous response to fear, but it totally changes my perspective. For two hours the storm rages, but we never need the sat-phone. The wind diminishes, and the rain lets up. Zippers slide open and we emerge into the cool, damp wind. Before our eyes for the next 15 minutes is the most amazing lightning show. Every minute or two, giant fingers of lightning snake across the sky in jagged white lines. Our relief is palpable. We crawl back into the tents to catch a little sleep before dawn. 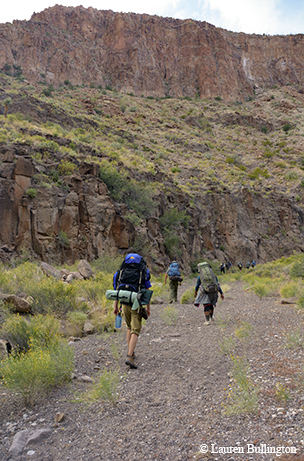 The Rancherias Loop is probably the most popular backpacking route at Big Bend Ranch State Park, for good reason. Unlike its better-known neighbor to the east, Big Bend National Park, the state park is wilder and less crowded, and contains more of a vital resource — water. Though it’s still an arid desert landscape, more than 100 desert springs and seeps come to the surface at Big Bend Ranch. On this trail, you can carry a day’s worth of water and collect water to filter at some of those springs. The loop connects Casa Reza and Rancherias Springs, conveniently situated to provide water-replenishing stops for nights one and two, with a six- to eight-hour hike each day between them. Along the way are stunning views of the Bofecillos Mountains, vast canyons, magical cottonwood groves, side-trails to waterfalls and more. Before we start our backcountry backpacking, we gather at the Barton Warnock Visitor Center in Lajitas, where Superintendent David Long gives us a fascinating introduction to this part of the Chihuahuan Desert around a giant relief map of the region. Volcanoes are the key to understanding the Big Bend landscape. David shows us the outcome of several major eruptions and flows 30 million to 40 million years ago. Inside the park, the gigantic Solitario erupted about 32 million years ago, creating a vast ring of mountains around a central valley. But even more colossal is the stupendous San Carlos Caldera, just south of the Rio Grande. This was a mega-volcano, displacing some 300 cubic kilometers of earth (compared to about one kilometer at Mount St. Helens). It spread an ash flow that covered everything in and around the state park, leaving soft volcanic tuff that’s often wind-blown into odd spires and shapes known as “hoodoos.” That giant wall of mountains in Mexico visible behind us — that is the caldera’s outer rim, also known as the Sierra Rica range. After David’s talk, it’s high time to be hitting the trail, and we spread out gear and load backpacks in the parking lot. We examine who’s bringing what and try to avoid redundancy (no need for all of us to bring stoves). Someone has brought a bathroom scale; we all take turns weighing our backpacks. My loaded pack weighs 35 pounds — seems like a lot to me, but others weigh more, a lot more. After the lightning storm on the first night, we arise on day two to a rain-washed world, still gray and overcast but fresh and wildly inviting. As we clamber down the trail into Panther Canyon, we see the green grove of cottonwoods next to Casa Reza, and soon we are there, filtering water in the shady spring below the adobe house. If any dwelling could be said to be in the middle of nowhere, the Reza homestead certainly qualifies. It first showed up on the tax rolls in 1911. According to oral accounts, the family, which ultimately totaled eight souls, lived in a cave until they built the mud-walled house. They subsisted on income from the sale of goats, wool, vegetables and tortilla-shaped goat cheese rounds called asaderos. The house is unsafe and historically important, so hikers are told to avoid going into it or camping near it — most people camp across the stream on the other side of the cottonwoods. After lunch, we hike north through upper Panther Canyon to Panther Spring, clambering over and around trees in the narrowing gorge. By midafternoon, we come up out of the canyon and walk along a park jeep road, part of the historic route between Polvo (now Redford) and Lajitas in the early 1900s. The sun now beams out of a cobalt sky, and the open space and far vistas are markedly different from the close canyon confines. When shadows lengthen, we turn south into Rancherias Canyon; before dark, we make it to Rancherias Springs, to my eye the prettiest spot on the trail. Here, tall cottonwoods follow the snaking canyon for more than a mile. We filter water and rest at the spring, listening to the wind sighing in the boughs overhead. Like Casa Reza’s spring, Rancherias Springs is another sensitive zone, where backpackers are urged to camp upslope at least 300 feet from the springs. It’s a great place to spot birds and wildlife, as well as javelinas, mule deer, mountain lions and all the other surprisingly diverse and numerous desert creatures that use such springs. In the early light of our third day, we climb up onto Lower Guale Mesa, a hard, steep trail; by midday, we’re poised for the last miles across the high plateau. Here I experience yet another of the many wonderful ambassadors’ practices. Tyler announces that Lauren Bullington, a Dallas-area forester, will lead us in a silent walk. She dispatches us across the mesa one at a time, about 1,000 yards apart. For an hour, we traverse alone with only our thoughts in thundering silence. Ahead of us, to the south, we see two amazing mountain formations appear: the conical Aguja de Santana (aguja means needle) and the guitar-shaped Sierra de la Guitarra. You get to know people along the trail — everyone has a story. Tyler and I noticed early on that Erin-Audrey Allen of Houston seemed to be really working hard to carry her pack, which looked unusually large and heavy. We later discover she has brought things like a large can of mosquito spray, a full roll of duct tape, heavy food, a bunch of thick clothes and more. She’d backpacked only once before, at an ambassador training session. But even with that heavy pack, she was rocking it. As we hike, she tells me how she had moved to Houston from College Station, leaving all her friends and family behind. Then, a broken relationship left her in depression, resulting in unwanted weight gain. Something happened, though, long before this chance to test herself at Big Bend Ranch. Erin-Audrey hit a low point where she decided things had to change, and she turned her life around. She began exercising and eating healthier, losing 50 pounds. This Big Bend adventure is a high-water mark on her road to newfound happiness.